If I spot a trend among my customers, clients, neighbors, and friends, I ALWAYS feel compelled to share it with you. In the past month, I can’t even count the number of time people have said to me “I am sick of mulching over and over again, year after year. I want to have plants instead of mulch.” My sentiments exactly! When I first started my gardens at home, I needed at least 20 yards of mulch each year to spread between my plants. Now, I use a mere 5 yards and that amount shrinks every year. 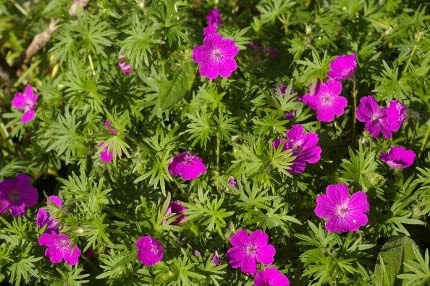 We allow cranesbill geraniums to form ground covers beneath our roses and perennials in the Natureworks gardens. Double the color, double the beauty, and a lot less mulch. back around the plants. Next, if there are huge spaces between my plants, I am waiting to see if any self-sown plants come up. Voila! 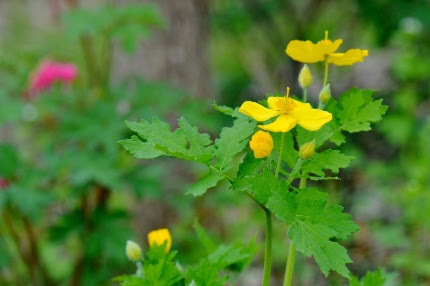 Right now I am spotting tons of breadseed poppies, borage, and Verbena bonariensis to name a few. Finally, any spaces left that are not filled by self seeders, I am filling with MORE PLANTS! In my back yard, where I have a lot of ground to cover, I am using fast spreaders such as mountain mint (Pycnanthemum muticum), asters, Helianthus ‘Lemon Queen’, culinary oregano, large leaf Ajugas. It is interesting to see which combinations really work well and which ones become unbalanced after a short period of time. This is an experiment in progress. 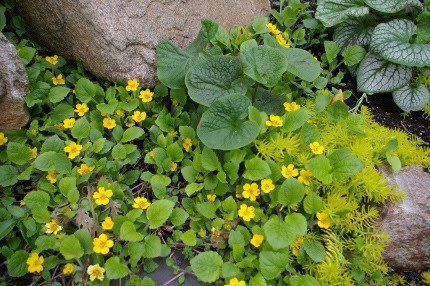 Above is one of my favorite native ground covers, Chrysogonum virginicum intermingled with Sedum ‘Angelina’ and Brunnera. No mulch here! Roy Diblik, in his book ‘The Know Maintenance Perennial Garden’ said “There is no plant on earth, herbaceous or otherwise, that has any genetic knowledge of how to live amid an accumulation of wood,” Hmmm…. Adding more plants makes the diversity in your garden so much greater. It’s better for the butterflies, the pollinators, the hummingbirds, every creature that you share your yard with. Lessening the control, allowing plants to intermingle, observing the competition between plants and stepping back a little is a much more natural way to approach garden care.